The Global Volcanism Program has no activity reports for Emi Koussi. The Global Volcanism Program has no Weekly Reports available for Emi Koussi. The Global Volcanism Program has no Bulletin Reports available for Emi Koussi. The large volcano of Emi Koussi at the SE end of the Tibesti Range forms the highest summit of the Sahara. The 60 x 80 km massif was constructed over a basement of Cretaceous and Paleozoic sandstones. Two nested calderas, 12 x 15 km in size, truncate the dominantly trachytic volcano, whose 3415 m high point lies on the southern caldera rim of the low-angle pyroclastic shield volcano. The calderas contain several explosion craters, lava domes, and young scoria cones, along with lava flows of recent and pre-modern age (Geze et al., 1959). The spectacular Era Kohor (Trou au Natron du Koussi) caldera on the SE floor of the 2nd caldera is 2-3 km wide and 350 m deep. The latest activity in the calderas produced three maars, and numerous basaltic cinder cones and associated lava flows have been constructed both within the calderas and on their outer flanks. The Yi-Yerra thermal area is located on the S flank. Gourgaud A, Vincent P M, 2004. Petrology of two continental alkaline intraplate series at Emi Koussi volcano, Tibesti, Chad. J. Volcanol. Geotherm. Res., 129: 261-290. Permenter J L, Oppenheimer C, 2007. Volcanoes of the Tibesti massif (Chad, northern Africa). Bull Volcanol, 69: 609-626. Vincent P M, 1963. Les volcans Tertiares et Quaternaires de Tibesti occidental et central (Sahara du Tchad). Mem Bur Recherche Geol Min, 23: 1-307. The Global Volcanism Program is not aware of any Holocene eruptions from Emi Koussi. If this volcano has had large eruptions (VEI >= 4) prior to 10,000 years ago, information might be found on the Emi Koussi page in the LaMEVE (Large Magnitude Explosive Volcanic Eruptions) database, a part of the Volcano Global Risk Identification and Analysis Project (VOGRIPA). There is no Deformation History data available for Emi Koussi. There is no Emissions History data available for Emi Koussi. 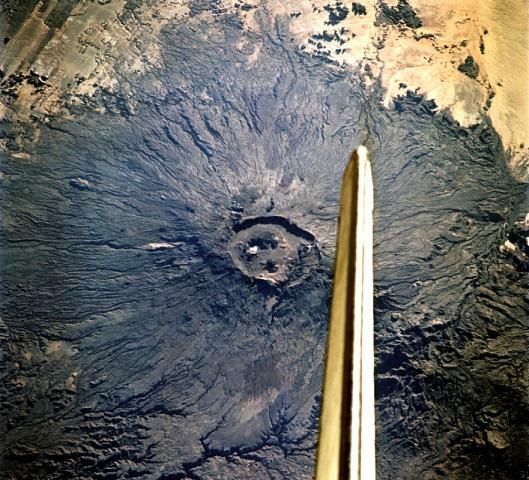 The vertical stabilizer of the Space Shuttle Endeavor almost appears to point out the summit caldera of Emi Koussi volcano in the Tibesti Mountains of Chad. Emi Koussi lies at the SE end of the Tibesti Range; its 3415-m-high summit is the highest in the Sahara. Nested 12 x 15 km wide calderas at the summit contain large explosion craters and young basaltic scoria cones. NASA Space Shuttle image STS108-701-008, 2001 (http://eol.jsc.nasa.gov/). There are no samples for Emi Koussi in the Smithsonian's NMNH Department of Mineral Sciences Rock and Ore collection. Large Eruptions of Emi Koussi Information about large Quaternary eruptions (VEI >= 4) is cataloged in the Large Magnitude Explosive Volcanic Eruptions (LaMEVE) database of the Volcano Global Risk Identification and Analysis Project (VOGRIPA).